What are the benefits of a chrome finish on my towel rail? Chrome is one of the most popular finishes for bathroom fittings because it’s more resistant to moisture and corrosion than other metals and provides a brilliant shine that can help light reflect through the room. You may find during your research that chrome towel rails are less efficient as the plating acts as an insulator but you shouldn’t let this put you off owning one! While chrome plate does act as an insulating layer, the effects are very minimal and won’t make a noticeable difference to your energy usage compared to a towel rail with a regular painted finish. Are chrome towel rails easy to keep clean? Chrome towel rails are very easy to keep clean, although their shiny surface does make it easier to see water stains or fingerprints. A simple wipe with a soft, damp cloth is usually sufficient to keep them gleaming but you can also use warm water and a little soap to get rid of any persistent stains. To really get your chrome plated towel rail buffed to perfection, a little bit of baby oil on a soft cloth can help bring it up to a brilliant shine. This depends on whether you want your rail just for towel heating or whether you want it to also function as the main source of heat for your bathroom. If you’re just looking for a rail as a storage and warming solution for your towels, all you’ll need to do is check the product specifications to ensure that your chosen rail will fit your wall space. Should you want your towel rail to act as a room heater, you will need to check individual product pages for the ‘heats up to’ value of the towel rail. This will provide a room size in m² to indicate the maximum area the towel rail will be adequately able to heat, so always look for this value to ensure that you’re purchasing a product suitable for your bathroom space. 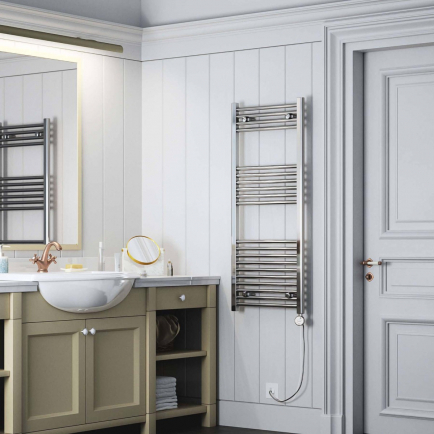 If we don’t have a chrome towel rail in the room size you need, take a look at the rest of our fantastic range for more inspirational styles. Designed for practicality yet offering a sleek and contemporary finish, chrome towel rails are the ideal heating solution for any bathroom interior design scheme. 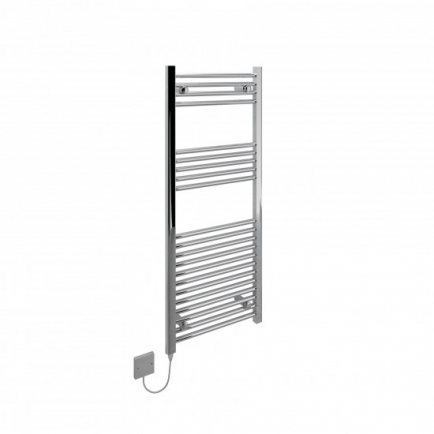 The dual-purpose electric towel rail allows simultaneous heating of both the bathroom and your towels, whilst running costs are kept low as the towel rail is controlled independently of your central heating system. This stylish and economic heating solution can also be used in conjunction with additional controllers, which allow closer management of energy usage and in turn can help to reduce the cost of utility bills. Practical and effortlessly stylish, chrome electric towel rails are the essential heating accessory for bathrooms with a metallic design scheme.